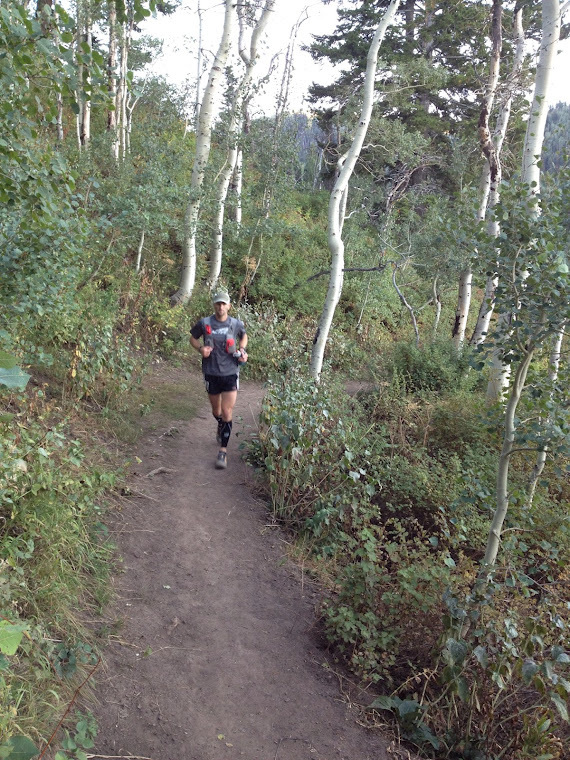 I had the pleasure of product testing the 2013 version of the Ultraspire Isomeric Pocket during my running of the Wasatch 100 Mile Endurance Race. 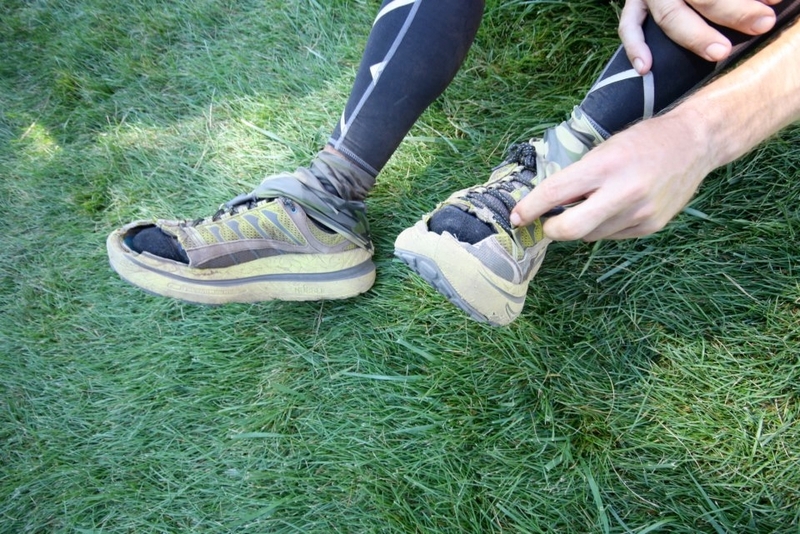 Already an Ultraspire gear whore, I went into this race fully outfitted in their gear. 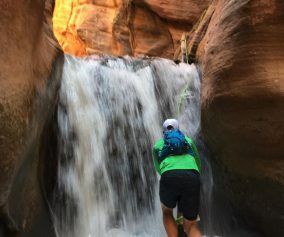 I used the Synapse waist pack with Atom belt, then switched to the Surge hydration pack (sans reservoir, instead used the space for night gear and an extra water bottle) at Lamb’s aid station, mile 53. The one consistent was carrying the handheld for the full 100 miles. I’ve been using the current version of the Isomeric Pocket for several months now. I’ve been happy with the product, although nothing overwhelmingly stood out about it from other handhelds except for the larger pocket size and the way it cinches shut. That being said, it has been an attachment to me for over a thousand miles now. 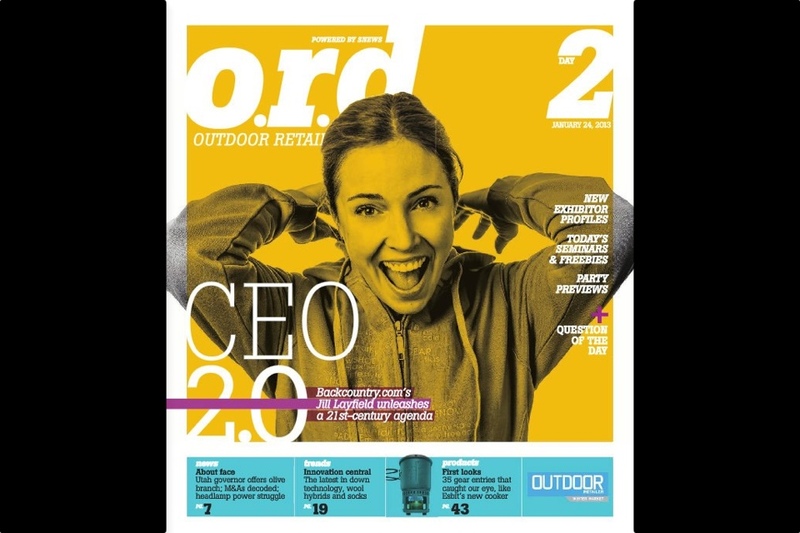 While the changes to the 2013 model seem modest, their impacts are astronomical. First is the change to the bottle. 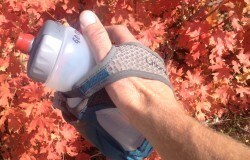 Early iterations of the Ultraspire bottle of any size resulted in massive leaks and even lids popping off. I have about four of these early bottles and they’ve been nothing but a frustration. To Ultaspire’s credit they have welcomed returns of all of these to be replaced with current, working versions. 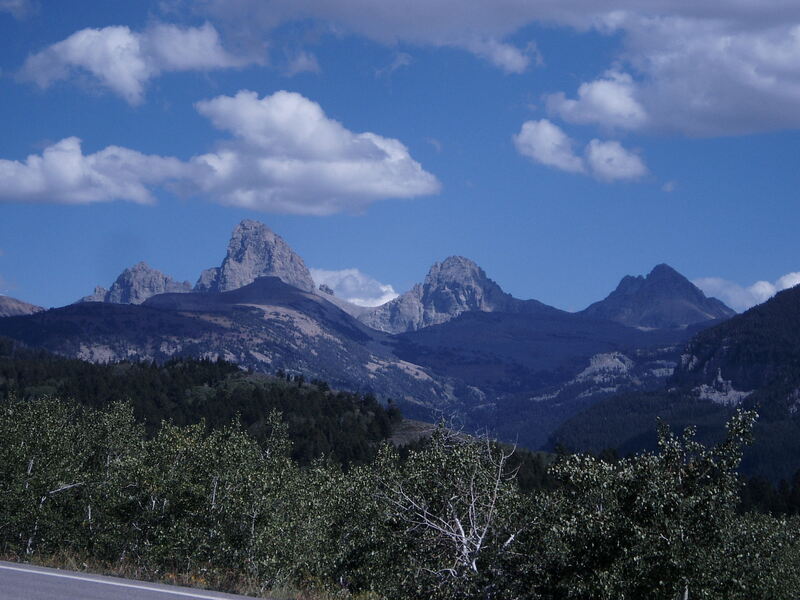 I can sustain the fixes on the current versions in that I used one for all of Wasatch and never had a problem. Add to the fact that the bottle is slightly larger than other handhelds at 22oz and it is just the added touch for getting you to the next aid station. Second, like many brands of handhelds that have a sleeker, smaller race version of their larger trail handhelds, Ultraspire has the Isomeric 8, which allows for a thumb hole in the hand strap. It is a feature in smaller race bottles that has seemingly been skipped over in the larger trail versions. Ultraspire decided to add this feature into the 2013 Isomeric Pocket (and likely Race version) and the result is game-changing. 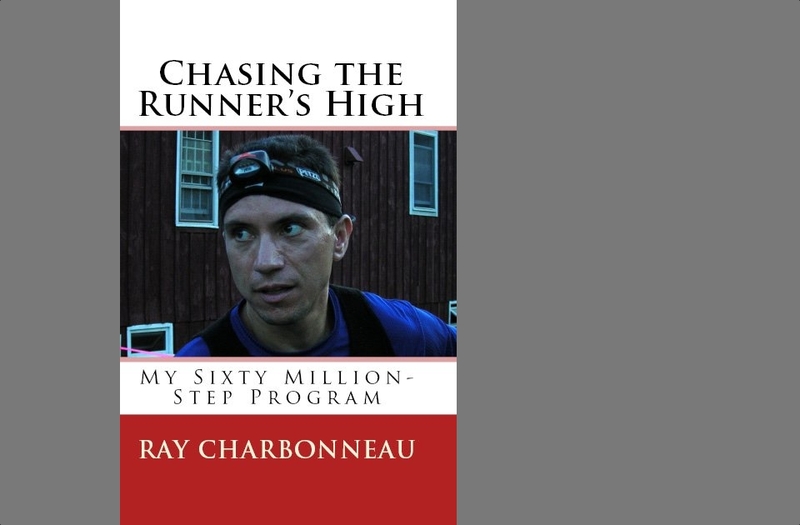 I’ve raced three other 100 milers with a handheld and even though the wrist strap helps magnitudes with not having to grip the bottle there has always been some pressure required, whether on the bottle itself or between thumb and index finger. With this new change to allow the thumb through a hole, not only can the whole hand relax more, but there is absolutely no grip required except to take a drink. In past races I would have to switch hands to give them a rest, but that wasn’t required this time. While I did it simply to free up my right hand from time to time, it was never because my hand/wrist was fatigued. 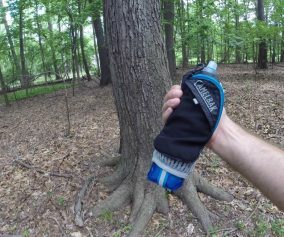 Also, and here is a little race tip for any of you out there, when I power hike I often remove the bottle and just hold onto the strap. 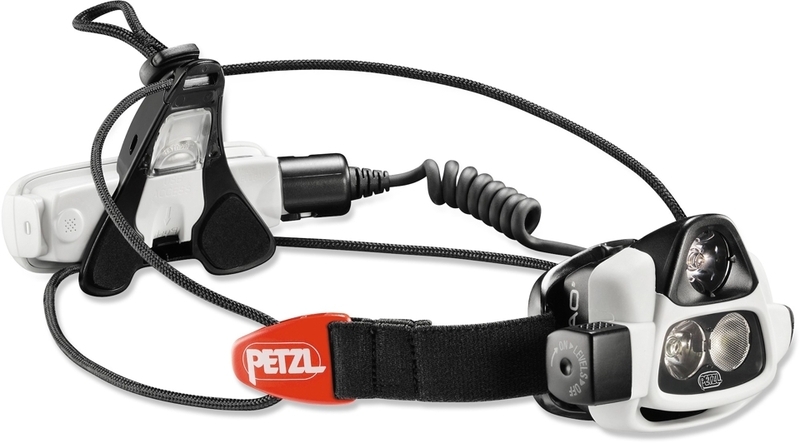 If you are a hands-on-knee kind of hiker on the steeper terrain, as I am, you’ll really appreciate the new hand strap because it allows you to insert your index finger in into the hole and the rest of your hand under the strap, making it easier to put your hands on your knees without the bottle trying to fall off. I realized it early in the race and it was a valuable discovery that allowed me to not think about my bottle while climbing. 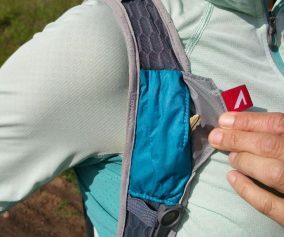 Finally, this may seem like a very small change (if it is a change, at all), Ultraspire appears to have tightened the elastic on the pocket, ever-so slightly. I used to be marginally worried that I would lose things, like my phone; not any more. Other notable advantages to this handheld over other companies, although included in the current model, is the padding placed between the palm and the bottle. This allows for the palm to get air to it, reducing sweat. It also means I was able to add tons of ice in the middle of the race, at the hottest part of the day, without it freezing my hand off, something that could only have been managed with other brands by buying their insulated model. Additionally, the cinch loop in the 2012 model is sewn in place whereas the 2013 model it is fluid and makes it easier to tighten and loosen the strap. I’ve got pretty much every brand/model of handheld on the market. I can say with all confidence that this new Ultraspire Isomeric Pocket 2013 is by far the best thing I’ve used, to date. 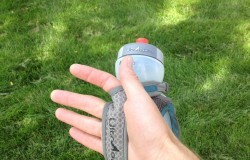 Kudos to Ultraspire for correcting the bottle issues and for making valuable upgrades to an already great product. 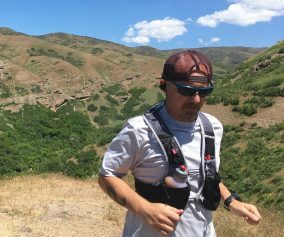 I carried the same handheld during the last 20 miles of Wasatch. I should have carried it the whole way. My iPhone plus a GU pack fit perfectly in the pocket. Good tips on new grips — I never thought to use the top as a thumb-hole. Great review, I’m in for one! 3 questions, 1.is there anybody local that stocks them? 2. Does the Magnon pocket version have the same reverse grip for power hiking. 3. Is there any way I can purchase it that helps support you guys? Hey, thx for the nice review! One question: Will the strap take any (UD) bottle?